I was on a bench in the park when he sat down beside me. The boards creaked beneath his weight. I felt his heavy breathing and heard him sigh. When I looked up, I tried not to panic. 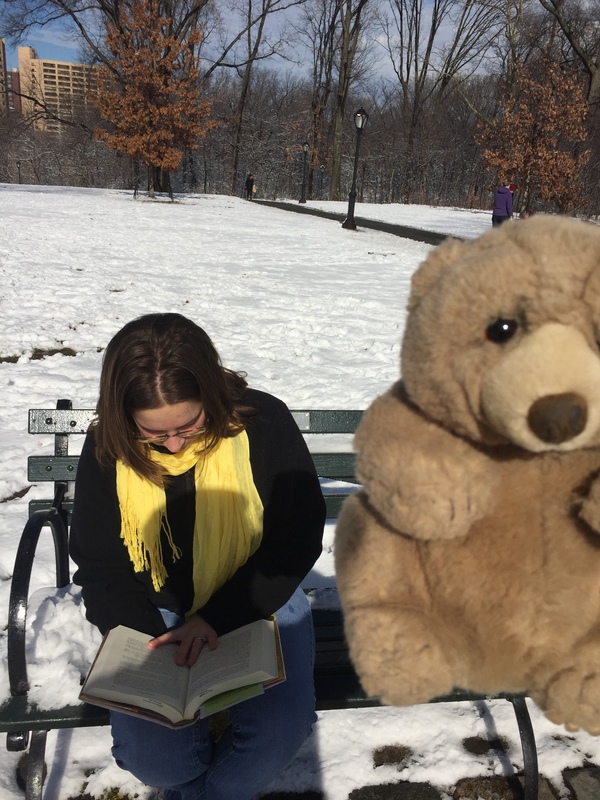 It’s not within my usual daily experience to find a large brown grizzly bear sitting beside me on a park bench, or any bench for that matter. I comforted myself by remembering I never heard him approach since I was so absorbed in my book. If his object had been to hurt me, he already would have done so. Besides he didn’t look very threatening, just sad. I decided not to run away screaming, and casually turned the page of my novel to resume reading. He sighed again, the heavy hearted sigh of a bear in the midst of some deep trouble or other. The park was empty today but for us and he could have sat on any empty bench. Assuming he was lonely, I closed my book, marking my place with my finger, and cleared my throat. He turned his head towards me. His sad brown eyes looked briefly at me then turned to gaze mournfully over my head at the surrounding park. He sighed and closed his eyes. “I might have guessed it.” He turned his mournful expression out over the park. We sat for a while, watching the leaves skitter and blow in the breeze before I spoke again. He didn’t answer immediately, but when he did he pressed his paw to his forehead and messaged his temples. His deep rumbling voice made the bench tremor as he spoke. “I see,” I said, though I didn’t see at all. This was the first bear I’d met with a pet cat. I had no response to this. It’s one thing for a bear to own a pet cat, but it’s another thing entirely for that pet to be allergic to him. He let out a long sigh, and as he exhaled, his shoulders drooped and slouched. Fearing he might begin to cry, I reached over and patted his shoulder. “Well,” he said. “I should have known. I’ve never been able to keep a cat more than three months. They all run away.” He turned his face towards me so his snout nearly touched my nose. “Or die,” he added. If you’ve ever had a grizzly bear rumble the word, “die” at you while looking in your eyes, you would probably understand me when I say that it made me a little uncomfortable. I patted his shoulder again. He heaved another broken sigh. “You can say that again,” he said. We sat in silence for a while, just listening to the breeze ruffle the trees. I know that the sounds of the park this time of day usually lift my spirits and the sun had come out of hiding from behind the clouds, casting vitamin enriching rays over the gloomy slouching bear. “Robert. It’s a pleasure to meet you.” A world weary half smile touched the corner of his mouth, giving more an impression of forced cordiality than actual happiness, as though he doubted I meant it. He nodded politely towards me and began to shuffle away. I watched him for a minute, replaying our odd conversation in my head, when a thought struck me. Unsure if we should ever meet again, I called out to him before he had a chance to disappear. “Wait,” I said. He turned back to me. “Why did you need change for a dollar?” I asked. I turned towards the machine. From my seat, I could see it had one of those new fangled slots that took credit cards. I smiled to myself and turned back to him. “Just hold on a sec,” I said. I ran to the machine, and, in the work of an instant, was jogging towards him with a soda in hand. “Here,” I said, handing it towards him. There were tears in his eyes and his expression was the closest thing to a smile I’d yet seen. He looked down at the bottle and it was as though someone had cut his bungee chord and he now stood a fair chance of plummeting to his death. “It’s pepsi,” he said with a soft choke in his voice. 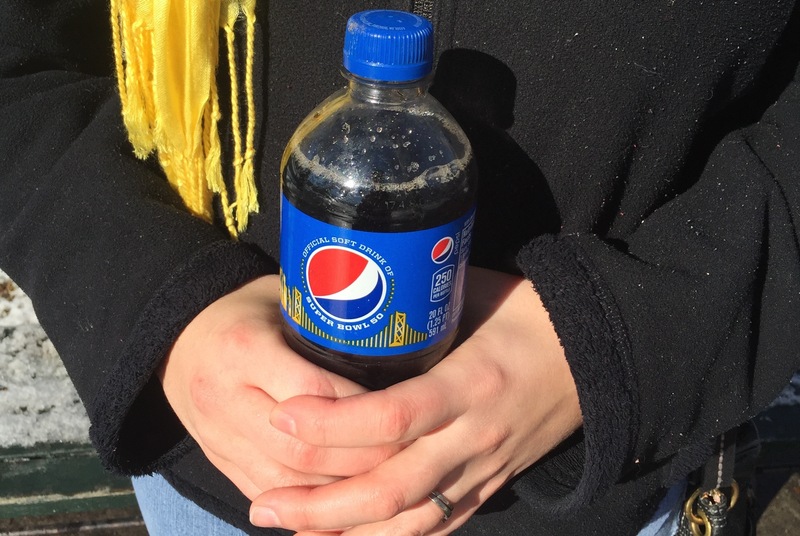 He sighed again, shook his head, and said in a low gloomy voice, “I should have known.” He handed it back to me and left me standing alone in the park with the pepsi in my hand. That was hilarious!!! I kept laughing on that one. Nice picture too! …Having had the pleasure of meeting Robert, I can completely understand the mood he was in… It seems he is always that way… Something in his eyes I think? I love this. I seriously needed to smile. Thank you ❤️ I’m a little upset at Robert’s manners, handing back the Pepsi 🙄 I mean you tried..😂 don’t stop writing.